➤ The Triangle Area = Economic Growth…and Amazon’s New Home? Let’s face it, people love it here! And as one of the cities on Amazon’s “Top 20,” that trend is keeping up. Whether Amazon does settle here or not, on the real estate front, our robust economic growth means more strong real estate gains. ➤ Demand is still very strong, but the market is “stabilizing” a bit. Lately, well-marketed and correctly priced homes, especially those listed under $350,000, have been flying off the market, many with multiple offers. 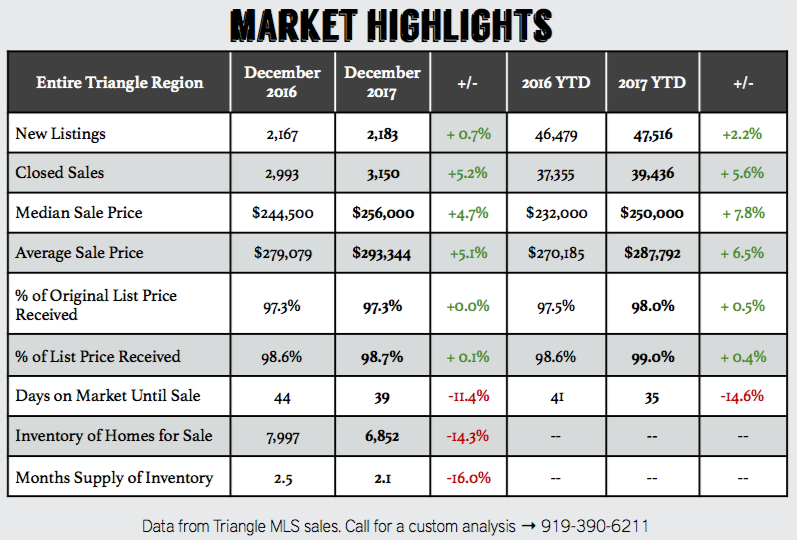 Despite huge demand, the actual number of new listings has only increased by 2.2% since this time a year ago, but the number of homes sold is up 5.6%. Pent up demand is the driving force. All this said, the Greener Grass Real Estate team has seen signs of a slight slowdown. This isn’t necessarily bad—it just means the market is catching up. What does this mean for homeowners who are thinking about selling? ➤ Now is a great time to start the process for selling your home. The Greener Grass Real Estate approach means strategic marketing and concierge service—so you get exceptional results, without the hassle. We will cover your goals, and our strategic approach to getting you the highest possible price in the fewest days on market. To your success in 2018! Thinking of selling in the next 12 months?